KUALA LUMPUR (Sept 25): The FBM KLCI climbed onto the positive territory today, halting four straight days of losses and closed 3.03 points or 0.16% higher at 1,843.11 points, despite the Asian stock markets suffering a decline as the US dollar hit a four-year high. 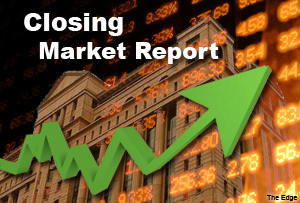 A market analyst said the rebound in the US market overnight had helped cushioned the KLCI against another day of losses. “However, the Asian stock market will continue to under pressure, because of the strong US dollar. The dollar has strengthened against all the major currencies and you could see its recent impact across the stock markets in Hong Kong and Taiwan,” he said. “Stronger US dollar would encourage further outflow of funds from the Asian region. If the dollar continues to appreciate against the ringgit, more pressure will be felt in the local market,” he added. Overall, Bursa Malaysia played host to 419 gainers, 437 decliners and 308 unchanged counters today. A total of 2.4 billion shares were traded, with the value of RM1.85 billion. Kuala Lumpur Kepong Bhd, My E.G. Services Bhd and The Store Corp Bhd are the top three gainers today, in terms of value. Meanwhile, Press Metal Bhd, Batu Kawan Bhd and United Plantations Bhd were among the top losers. As with Wednesday, the two most actively traded stocks were Sumatec Resources Bhd and PDZ Holdings Bhd. They saw over 150 million and 130 million shares traded respectively. Across Asia, Japan’s Nikkei rose 1.28%, while South Korea’s Kospi and Hong Kong’s Hang Seng both recorded losses of 1.53% and 0.59% respectively.